Bring your computer protection to the next level! Get unique combination of real-time antispyware protection together with alerts preventing you to enter potentially dangerous websites. 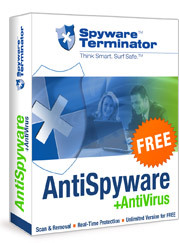 Effective Spyware Protection - Spyware Terminator prevents spyware from infecting your computer. Free 100% Real-Time Protection - Guards your system and ensures spyware is intercepted before it installs. Antivirus Protection Included - Extended detection of malware during scans and within the Real-Time Shield. Safe Internet Browsing and Search - Web Security Guard is one of many useful Crawler Toolbar’s features that displays website reviews and threat level to help prevent users from entering potentially dangerous websites. Note that the real-time scan does not function on Win98 and 64 bit systems. Nah kemarin dian download sofware ini. Awalnya sih buat jaga-jaga aja kalo kena spyware tapi ternyata di dalam fiturnya ga beda jauh sama antivirus. Langsung aja aja dian install. Setelah nginstall eh ternyata harus download online. Setelah dYn baca-baca lagi di webnya ada 2 installasi yaitu secara online dan secara ofline and yang dian download itu instalasi secara online. Nah karena speed inet dYn yang rada - rada caur (lambat, lemot, ). disini atau disini untuk instalasi secara online dengan size 632kb dan disini untuk instalasi secara offline dengan size 9.3 Mb .